This particular pyramid scheme operator received a degree of attention in 2006 when I did an examination of advertisements in my local paper. They did not come out of it looking good, but why would anyone expect anything different? 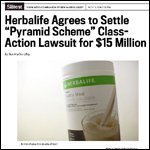 The operators of the pyramid scheme Herbalife have agreed to pay $15 million to people who had been deceived into joining on the assumption that it was some sort of legitimate business opportunity. The wonderful thing is that the lawyers for the scam claimed that they did nothing wrong and are only paying out the $15 million so that they can get on with business as usual. It is a rare company which has $15 million that they can simply throw away to avoid a nuisance lawsuit. Still I suppose if your business is stealing money from unsuspecting people and providing nothing in return there should always be some spare cash in the till. The real reason they settled of course is that had the action gone to court the true nature of their deceptive business would have been revealed. In summary someone said Herbalife is a pyramid scheme and Herbalife said "Stop saying that. 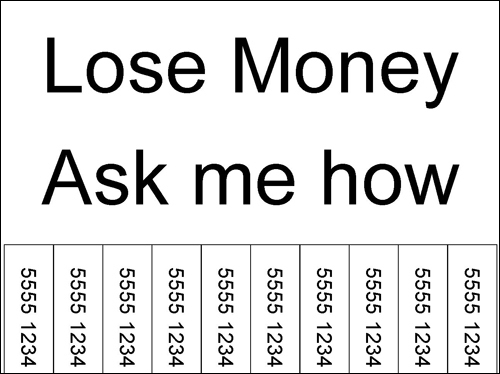 Here is a truckload of money to go away with". What they didn't say, of course, is "Yes, you are right and we will compensate you for the losses you have made by believing our lies". You can read about the case by clicking on the image at the right. And here is a suggestion for the sign Herbalife distributors should stick on lamp posts in the future to attract new business.